Lennox and Addington County OPP detachment commander Insp. Scott Semple addresses the media during Thursday’s press conference. Photo by Adam Prudhomme. Operating under a misnomer for quite some time, the Napanee Ontario Provincial Police detachment has finally gotten around to updating a name that better reflects their coverage area. As of Thursday, the detachment is henceforth known as the Lennox and Addington County OPP. A further reshuffling took place when Ontario introduced amalgamation throughout the province, which led to Napanee OPP assuming responsibility for the stretch of Hwy 401 in its boundaries through Trenton. “There’s been a lot of change, but the one thing that never changed was the name,” said Semple. Although some of their coverage area actually extends out of L&A County, Semple says their new name closest reflected the geography they serve. Semple says their coverage area includes a population of 47,000 people, a number that swells to 60,000 in the summer and spans 302,200 square hectares, 229 km of highway, which includes 74 km of Hwy 401. The Lennox and Addington OPP employs 74 constables, seven sergeants, two staff sergeants, one detective, one inspector and 10 support staff. Semple also took the opportunity to announce the Lennox and Addington OPP’s auxiliary unit is now up and running. Made up of volunteers, the unit assists the OPP with community police, crime prevention initiatives, traffic collisions and patrol. Lennox and Addington unit will consist of eight members in June, with the intent to train more. “In the event of a large scale emergency and the OPP needed more members to deal with certain situations going on, they have 800 to 1,000 members across the province that are auxiliary that can step up and fill those roles,” explains Auxiliary Staff Sgt. Josh Belanger. Volunteers tain monthly while also taking part in local community events on behalf of the OPP. 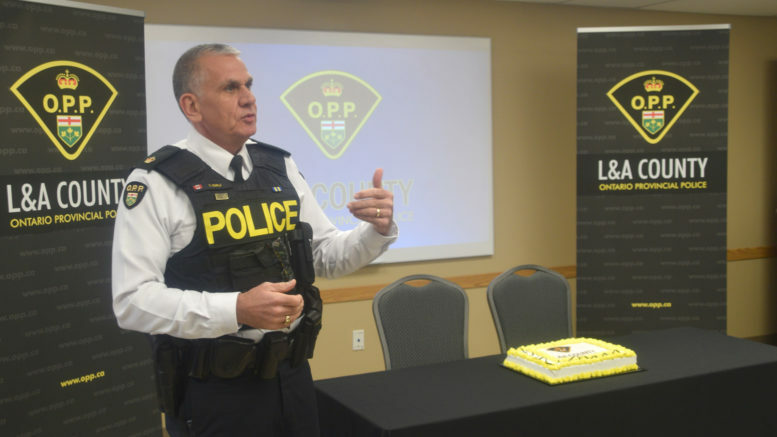 “If an auxiliary member wants to pursue a full time career as a regular member of the OPP, that gives them the option to build a rapport with the OPP and get some exposure to what the job is about,” said Belanger. Anyone interested in learning more about volunteering with the program can visit www.opp.ca.